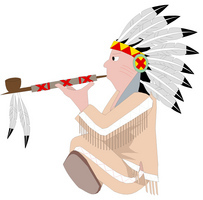 1 Peace pipes were sacred to Native Americans. Like all Native American artifacts, peace pipes were fashioned with great care. Smoking a peace pipe had great significance: it could seal a political agreement or arrange a marriage. 2 Like many other arts and crafts, Native American peace pipes have a legend behind them. The legend states that two young men were walking one night in a ravine. Suddenly, they saw a beautiful young maiden coming towards them. She had a dress made out of fine material. Each man fell in love with the girl. As she approached them, they noticed that she held a pipe in her hands. The girl offered the pipe to the sky and the earth and then held it toward the men. 3 The girl put the pipe on the ground and then turned into a buffalo cow. The cow pawed the ground, stuck her tail out behind her, and picked up the pipe with her hooves. Then, the cow turned into a girl again. She explained that she was giving them a peace pipe. She told them that a peace pipe should be a part of all sacred ceremonies and treaties.